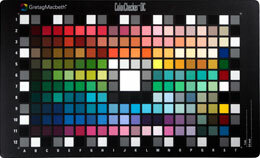 The GretagMacbeth ColorChecker® DC was intended as an enhanced color chart for digital camera profiling, hence the DC in the name (Digital Camera). The ColorChecker® DC consists of 237 squares of paint applied to paper then mounted to a cardboard backing with a black frame around all the patches. These patches are arranged in a 20 x 14 rectangular grid. The outer patches are a pattern of white, gray and black patches. The chart center has a white patch occupying 4 patch positions surrounded by 12 neutral patches. The patches have a matte surface except 8 patches in the nineteenth column which have glossy surfaces. Increased care must be excercised in lighting the chart to eliminate mirror reflections from these glossy patches. Most profiling software programs allow for ignoring these patches when there are glossy patch reflections. The ColorChecker® DC was offered in an 14 x 8.5 inches size. It has been replaced by the ColorChecker® SG. The spectral data for the ColorChecker® DC may be downloaded from the Spectral Library. Using these files with the demo version of SpectraShop™ will allow you to compare the spectra for the different editions and get colorimetric values for a large variety of viewing conditions.